In September 2013, international campaigners Nur Hidayati of Walhi (Friends of the Earth Indonesia) and Bondan Andriyanu of Sawit Watch (“Oil Palm Watch”) join EU NGOs to present this message to EU decision-makers. They show what life is like for Indonesian local communities affected by palm oil expansion for agrofuels. As well as the direct impacts of agrofuels like clearing forests for oil palm plantations, increasing demand for agrofuels creates a hunger for land that can indirectly cause more deforestation and land conversion – resulting in substantial greenhouse gas emissions from the soil and removed forests, peatland and vegetation. This is known as Indirect Land Use Change (ILUC). Existing agrofuels policies were founded on limited scientific information about the impacts of ILUC. Numerous robust studies have since emerged to show that when the impacts of ILUC are accounted for, most agrofuels do not achieve carbon savings. The EU’s Renewable Energy Directive (RED) and Fuel Quality Directive (FQD) do not account for this. Critical to the ILUC debate are the peatlands of Indonesia. Indonesia stores 65% of the carbon in global tropical peatlands; and the large-scale destruction of these rainforests and carbon-rich peatland landscapes can release “globally significant” quantities of greenhouse gases into the atmosphere. EU research shows that by 2025 an estimated ten million of Indonesia's 22.5 million hectares of peatland could be deforested and drained for oil palm and wood pulp. Expansion of palm oil in Indonesia – driven directly and indirectly by demand for biodiesel – is therefore an important global driver of human induced climate change. Research by the University of Leicester found that, when taking peatlands into account, biodiesel from food crops in Europe is as carbon intensive as fossil fuels. Scientific uncertainty around ILUC has been put forward as a justification for continuing to maintain support for agrofuels. Yet agrofuels’ promise to deliver lower emissions is far more doubtful. In any case, uncertainty is not a reason for inaction when there is evidence for potentially serious harm. The precautionary principle, a bedrock principle of European Union law, justifies the adoption of restrictive measures to minimise risk to people and the planet. Crop-specific “ILUC factors” can correct the carbon accounting gap, and are the best policy option currently available for the EU to avoid agrofuels that are counter-productive in reducing carbon emissions - and to steer bioenergy production in a sustainable direction. Problem 2: Agrofuels are causing land-grabbing, human rights abuses and conflicts in Indonesia. Plantation expansion for agrofuels is having devastating impacts on local communities in Indonesia. Lack of any social sustainability criteria in the RED and FQD means that the development and human rights impacts of agrofuels are not taken into account in EU policy. Globally, millions of hectares of land have been grabbed from local populations over the past decade in order to accommodate the EU’s growing demand for agrofuels. Vast areas of Indonesia’s forests are crucial for providing food (through gathering, growing and hunting) for around 40 million people in indigenous and forest-dependent communities. Through converting these forests to agrofuels EU policies threaten food sovereignty and increase the risk of food crises. In Indonesia, NGO Sawit Watch has identified 660 land disputes between communities and palm oil companies in 17 of Indonesia's 33 provinces. Child labour, lack of protections for plantation workers’ labour rights, and indebtedness are also linked to the Indonesian oil palm industry. As key providers of food for the family, Indonesian women are particularly vulnerable to loss of land, livelihood and food and water sources to palm oil concessions – as well as poor labour conditions on the plantations. Palm oil giant Wilmar has been widely criticised for failing to adhere to the law, for taking over communities’ and Indigenous Peoples’ lands without their Free Prior and Informed Consent (FPIC), for clearing forests without environmental impact assessments, and for illegal burning. 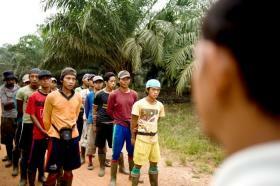 These abuses persist, despite Wilmar’s membership of the Roundtable on Sustainable Palm Oil (RSPO). With the majority of palm oil estates in the hands of companies such as Wilmar, Indonesian oil palm smallholders are rarely the ones receiving the financial benefits; instead local livelihoods are undermined. By turning a blind eye to these issues the EU is undermining its international development goals and failing to fulfil the legal duty to ‘Policy coherence for development’. EU Member States are failing in their obligation to “minimize the negative impacts [of agrofuel production] on biodiversity that would affect socio-economic conditions” including “the livelihoods of indigenous and local communities” (Convention on Biological Diversity (decision IX/2 )). The EU must ensure that agrofuels targets avoid incentivising human rights abuses, by reducing demand of harmful agrofuels, and establishing compulsory sustainability criteria to require human rights standards and fair trade principles. The Indonesian Archipelago is host to some of the world’s most carbon-rich and bio-diverse forests, such as the lowland rainforests of Borneo, Sumatra and Papua - home to rare and endemic species such as the Sumatran tiger and Bornean orangutans. Yet Indonesia is experiencing some of the world’s highest rates of deforestation and biodiversity loss; massive expansion of oil palm plantations is the key driver. The EU’s increasing demand for agrofuels to meet political targets is one central factor pushing this expansion (both directly as cheap palm oil for agrofuels, and indirectly by spurring new global vegetable oil demand). Indonesia is the world’s biggest palm oil producer and exporter with plantations covering around 11million hectares. This is set to expand to a total of around 28 million hectares by 2020. – unless the growth of agrofuels can be halted and reversed. Meanwhile, the intensive use of agrichemicals and the overexploitation of water resources for oil palm plantation development are causing river pollution, impairment to soil function, and water scarcity for local communities. Agrofuels present numerous economic and business contradictions. In 2011 alone, the agrofuel industry across Europe received subsidies totaling between €5.5bn - €6.9bn. This enormous investment of European tax payers’ money created only 3,600 direct jobs in EU agrofuel production facilities in 2011 and indirectly exacerbated the destruction of some of the world’s most significant and pristine forests, which are essential to mitigate climate change – notably those of Indonesia. Yet, in contradiction to this, EU Member States are simultaneously providing economic support and engaging in multilateral agreements to protect Indonesia’s forests as carbon sinks. Agribusiness-driven palm oil does not make development sense for Indonesian communities. It is linked to human rights abuses, a track record of labour exploitation and environmental damage, and land conflicts that marginalise vulnerable communities. The growing attention to the negative social and environmental impacts of palm oil (and other agrofuel crops) makes agrofuels a risky and unsustainable business investment – and shows how the EU is failing in its duty to ‘responsible development’. Full accounting of all CO2 emissions resulting from growing agrofuel crops (so-called ‘indirect land use change’ / ILUC), through crop-specific ILUC factors – for the FQD as well as the RED. This is the best policy option currently available to dis-incentivize agrofuels that are counter-productive in reducing carbon emissions (particularly palm oil). A halt in the growth of agrofuels that compete with vital food crops, with a genuine and robust cap (i.e. 5% or less applied to the FQD and the RED) on the use of agrofuels. Vote for the lowest cap possible. An independent social and environmental impact assessment of EU agrofuels policies on countries such as Indonesia – with a view to developing mandatory sustainability criteria to exclude any agrofuels or agrofuel feedstocks imported into the EU that do not meet environmental and human rights standards, and fair trade principles. Policy steps towards a phase out of all land-based agrofuels, and a phase out of subsidies, to bring their consumption down to zero as soon as possible. The introduction of policy incentives which put our transport onto a genuinely green path. Overall, policies which focus on greenhouse gas reductions, big energy savings, and modal shift in transport will be a more effective means of climate change mitigation, without the social and environmental costs of agrofuels. Marelli, L., D. Mulligan, and R. Edwards. "Critical issues in estimating ILUC emissions: outcomes of an expert consultation, 9–10 Nov 2010." European Commission Joint Research Center, Ispra (Italy) (2011).